Jeremy arrived in Liberia last night. 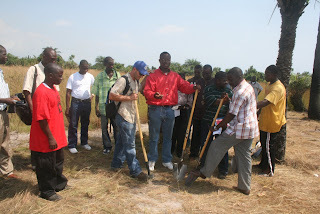 Today he went out to the property, 4 acres, that will be purchased for the school and orphanage. He said that it is flat, mostly cleared, in a great location, and perfect for the project and future buildings. Updates will be posted here as Jeremy gives more information to Kami. The surveying and deed should be finalized on Wednesday, then the plan is to begin work on the foundation. 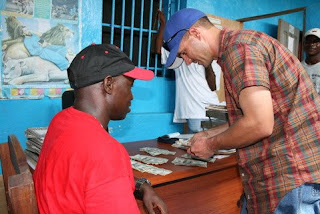 Here is a picture of Jeremy buying the property!!! He said that the property is perfect. The land was surveyed today and they started clearing the property. Tomorrow they are building a temporary shelter for supplies and then Thursday will break ground for the foundation. I also got this picture thanking the Fort Collins Soccer Club for their donations of soccer gear. The kids went absolutely crazy over the donated kleats, shin guards, cones, and jerseys. 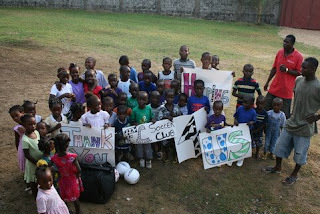 Thank you FC Soccer Club for touching lives in Liberia Africa!!! "Thank you FC Soccer Club 4 Helping Us"
The deed was signed today! Addy's Hope now owns 4 acres for the school and orphanage and all future projects! The foundation is being planned and supplies are being purchased. Addy's Hope had a ground breaking and dedication ceremony today at the new property! There was press out there covering the story. This first picture is of a prayer dedicating the property. 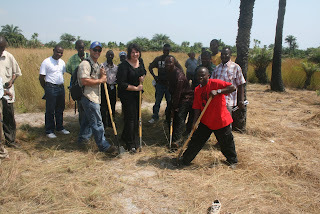 Here is a fantastic picture of Jeremy, HollyAnn, and Amos with shovels starting the ground breaking! Jeremy said today that there were 10-12 people out at the property working and the foundation is dug! The footings are being poured tomorrow. He said that it is estimated to be a 2 week process. Jeremy said that we are going to get a 20 foot shippping container, but the metal and trusses and solar in there and then pack it with anything else we can and get it headed over there! YEAH! Oh, and a supplies shed has already been built on the property. Jeremy said that the foundation was all dug by hand! He said that the concrete is all mixed by hand and if he calculated properly it is 100 yards of concrete. He leaves tomorrow to come back home so this may be the last update about the project until he arrives with more pictures and possibly video of the property.